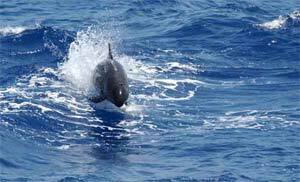 Photo of false killer whale in the Gulf of Mexico, courtesy of NOAA Fisheries. False killer whales got their common name because their skulls are similar to killer whales , not because their physical appearances are similar. Largely black or dark gray in color, false killer whales are easy to recognize because of their rounded head, curved dorsal fin, and the distinct bulge on the front edge of their flippers. False killer whales are found in all tropical and warm temperate waters, and are extremely social, usually traveling in groups of 20 to 100 individuals. False killer whales appear to eat a wide variety of fishes and squid, but also have been seen feeding on smaller dolphins. Adult males may grow to up to 6 m (18.8 ft) in length, whereas females are commonly about 5 m (15.5 ft) in length.False killer whales have been observed making a variety of vocalizations. The main categories of vocalizations seem to be ascending whistles, low-frequency pulse trains, high frequency pulse trains, and echolocation clicks. The whistles of false killer whales have been shown to be distinct from other dolphin species, and these characteristics can be used to identify individuals to species based only on acoustics. Their whistles are 5 kHz upsweeps that last about half a second. The first study of the echolocation of free-ranging oceanic dolphins was done with false killer whales. Scientists found that false killer whales make short duration (30 millisecond), broadband clicks centered around 40 kHz, with source levels between 201-225 dB re 1 µPa Pa peak-to-peak. Based on the characteristics of their echolocation clicks, the study estimated that false killer whales detect prey at ranges of 300 m (984.3 ft). 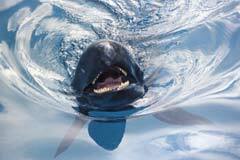 Looking into the mouth of a false killer whale courtesy of Yuko Stender, www.marinelifephotography.com. Scripps Institution of Oceanography, Voices in the Sea.